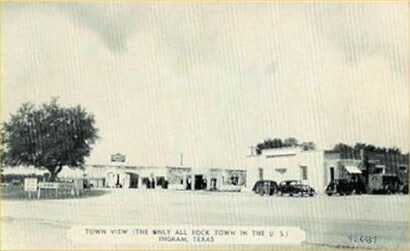 Ingram Town View. "The only all rock town in the U.S."
The state granted land here as early as 1847. 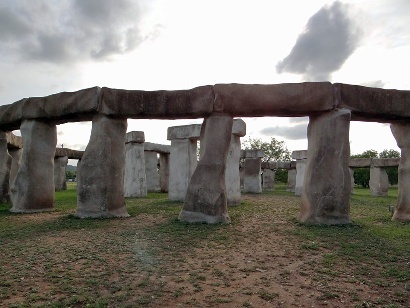 John Twohig of San Antonio was the original owner. In 1879 J. C. W. Ingram bought six acres opened a store and applied for a post office under his name. The earliest settlers were farmers. The stands of Cypress trees along the river provided raw material for the shingle industry, and later sheep, goat and cattle ranches were established. The area had a reputation for having a healthy climate. When popular singer and celebrated consumptive Jimmy Rogers moved to Kerrville in the 1920s, the whole region got a boost as a health Mecca. The region is dense with summer camps for various organizations, weekend retreats and lodges for hunters who want exotic game. West of Ingram on Hwy 39. Old Ingram - Off Hwy 39 and 27. Antique shops, galleries, restaurants in the Ingram's old business section..
Just south of downtown Kerrville on Hwy 16 across the bridge you抣l see the sign for 173. Go left on 173 and two and a half miles later you抣l come to the park entrance on your left. This 517-acre park offers canoe and tube rentals in the Guadalupe River. During the week it抯 VERY tranquil and on weekends it抯 still an improvement over the crowds found on the river back in Kerrville. Reservations recommended for overnight stay. Annual bicycling event every Easter Weekend. 830-257-5392. Comfort - Hwy 27 East 26 miles to Comfort via Center Point.